Everyone experiences the power of Saturn at some time in life. It can be difficult, heartbreaking, frustrating and painful. We may experience great doubt, delays, setbacks and misfortune. While we cannot avoid all pain while incarnated we can reframe and understand the purpose of that pain. This is done by understanding the power and intent of Saturn, also known as Shani in Vedic Myth. Saturn may seem to torture us, but that is only (usually) due to our lack of maturity or rising to the occasion of the moment in a selfless way. Just as we need the conscious influences of Venus, Mercury, Moon, Jupiter, Sun and Mars to work in harmony with our destiny, so too do we need to power of Saturn. 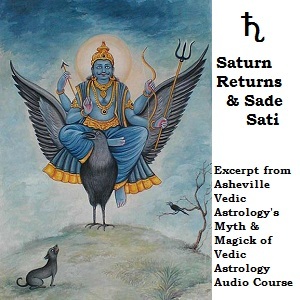 This series of recordings is an excerpt from the 13 Hour The Myth and Magick of Vedic Astrology Audio Course available through www.ashevillevedicastrology.com.